" I remember the ceiling over every bathtub I've stretched out in." Sylvia Plath is an American poet whose the greatest success in prose was her autobiographical novel“The bell jar”. In the story of this novel, as a result of the alienation from the every days, the heroine metaphorically "locks herself". She puts herself under a bell jar which is considered as a room for self-examination. 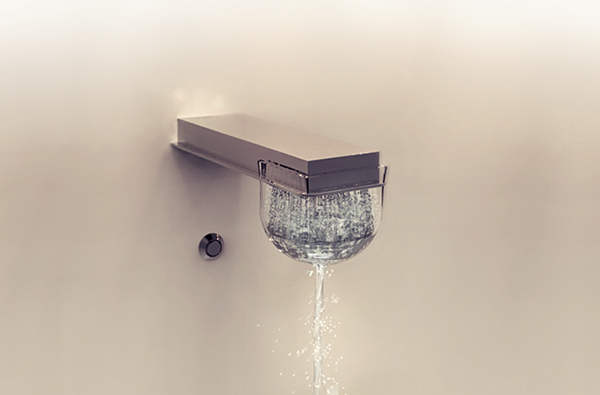 One of the key elements in the story is bathing, so when I was assigned to design a faucet for a competition at the university, I decided to use this element as the "dimension of communication" of my object, and, in this way, to create a "storytelling" product. 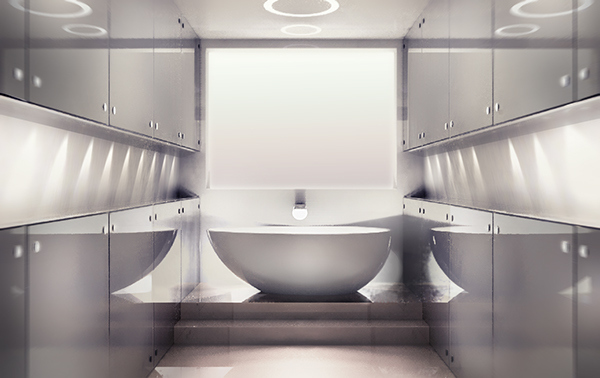 The bathroom, the atmosphere of bathing is a so-called "microbell" in people’s life; an intimate space for recharging and regeneration. Consequently, my shower-tap combination is constructed according to the universal symbol of bell jar. When I started designing, my primary task was to analyze and define the concept of water whose ambivalent nature (as it creates life and destructs at the same time) and its "limited freedom" were the most important aspects for me during the description. 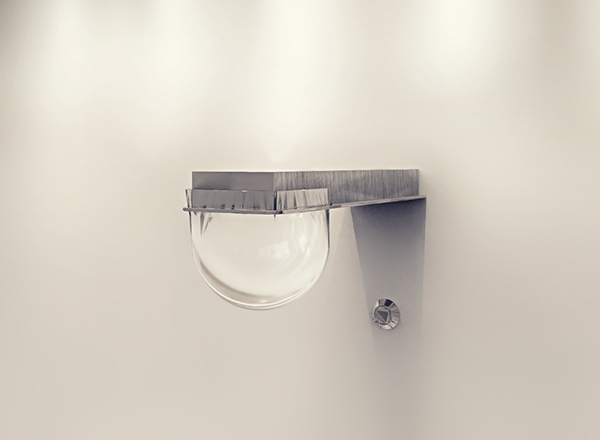 I designed an object the atmosphere of which reflects this ambiguity. Glass, which is the substance, forms an “ideal coupling” with water as it allows water to be seen and it is also an instrument of the symbolic expression. The "limited freedom", which is present in the shaping of the water jet, is the basic pillar of my functional approach. 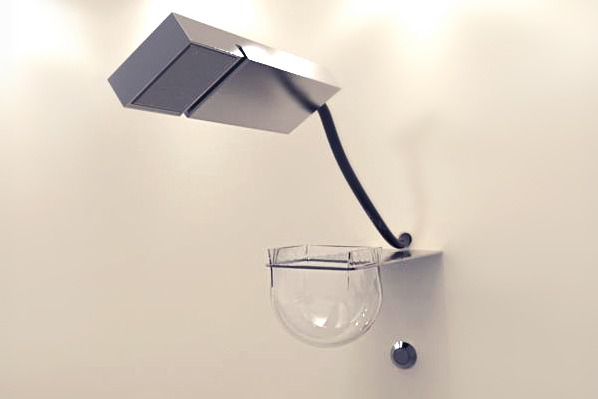 Water comes only from the showerhead and a transformer, which is fixed on the wall, changes its radius, so it functions as a bath tap - one of the reasons of this solution is that the most common failure of the components is usually attributed to the switch between the tap and the showerhead. The shower hose is in the wall, so if you push the button, you can pick up the showerhead. Taking shower is a practical thing which symbolizes humans in their basic condition - The object expresses it with slightly diverging jet. When the shower head is placed on the bell, the jet will be troubled, it diverges and the jets hit the bell's wall. This symbolizes the self-examination and the inner conflict which happens when one locks and monitors itself. Then a straight, calmer jet escapes from the bell which means the balanced, harmonic state when the inner conflicts dissolve and it leads to the bathing. 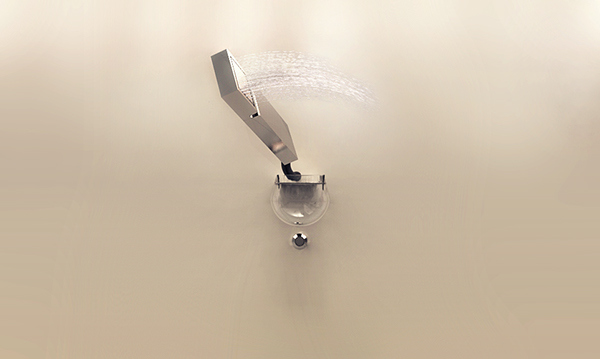 My faucet concept for a competition in 3D. Project supervisior - Pais Panni MOME 2014 | product design | BA II.